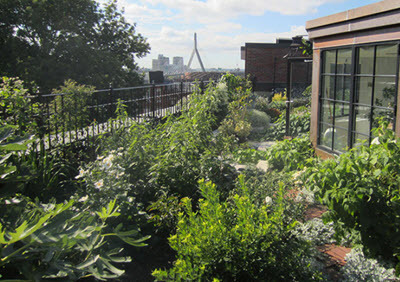 The two terms green roof and roof garden are often used interchangeably, but in some contexts the term roof garden is only used for planted roofs that provide outdoor recreational space for humans and/or grow food for them, while a green roof can be created to have very little human presence, e.g. a sloped roof planted with hardy succulents that wont need watering, weeding, or other human interference unless circumstances become extreme. Both roof gardens and green roofs are vegetated roofs, and they can help with internal temperature control for the building and catch rainwater to lessen the risk of urban flooding. They can also become important habitats for wildlife, such as birds and butterflies. Research is currently being carried out to study how planted roofs impact the urban heat island effect. Humans have grown plants on top of buildings for thousands of years. In some situations, it was a way of insulating the roof to provide a better indoor environment. In others, it was chiefly a way to grow food for humans or domestic animals. There are also plenty of old reports of roof gardens created simply for humans to enjoy. One example of old green roofs are the ones found on some of the ziggurats in ancient Mesopotamia (4th millenium BC – 600 BC). The zigguarats were massive stone structures built for religious purposes. Some of these ziggurats had trees and shrubs planted on aboveground terraces. In the Roman world, roof gardens and planted terraces were very popular among those who could afford them, and could also be a way to make public buildings even more impressive. A roof garden was for instance created for the audience hall in Roman-Byzantine Caesarea. In the famous city of Pompeii, the Villa of Mysteries had an elevated terrace where plants were grown. Both the villa and the garden were buried in the eruption of Mount Vesuvius in 79 AD. If we move into the Middle Ages, there are reports from the city of Fustat in Egypt indicating that a number of multi-story buildings here had gardens on their roofs. The Persian writer and traveller Nasir Khusraw (1004 – 1088 CE) describes how some of these buildings are 14 stories high, and that ox-drawn water wheels are used to bring water to the gardens. A roof garden is typically made for humans to visit and enjoy, although it is, of course, possible to create a butterfly garden, a honey bee garden, etc on a roof as well. Some roof gardens are open to the public (admission fee might apply), while others are strictly for the use of the building residents and those they invite. One example of a famous roof garden, or actually gardens, are the Kensington Roof Gardens, covering a total of 6 000 square meters on top of a former department store on Kensington High Street in central London. When they opened in the 1930s, the admission fee was 1 shilling, and the money raised was donated to local hospitals. The Kensington Roof Gardens are still in place today and include trees, bushes, a pond, a waterway, and – of course – many different types of flowering plants. There are even flamingos and ducks living here, and a bar for visitors to enjoy. At night, the gardens are lit by an elaborate lighting system. Rooftop farming is often described as a newly invented trend, but the truth is that humans have bee growing food on roofs and terraces for thousands of years. Today, many different types of rooftop gardens exist. In addition to conventional roof gardens, there are hydroponic, aquaponic, and aeroponic gardens. Container gardening is a popular choice since the containers protect the roof from the roots. One example of a successful roof garden is the one on top of Trent University in Ontario, Canada, where food is grown for local consumption. Rooftop farming can be very profitable and there are a number of different upstarts that tries to make money growing vegetables on roofs in New York and other large cities. Green city growers are one example of such as companies. Most companies focusing on rooftop farming are small upstarts and none of them are, as far as we know, publicly traded. The only way to invest in this companies is to buy stock traded on a secondary market, investing in a fund that invests in green startups or by investing in options based on these companies. We are told that IQ broker (formerly IQ option) offer option based on companies active in this industry. Landscape architects tend to use the terms “extensive vegetated roof” and “intensive vegetated roof” when describing different types of roofs with plants on them. Roof gardens and roof agriculture typically fall into the latter category, while extensive vegetated roofs are comparatively thin vegetated roofs that can be sloped or flat. Extensive vegetated roofs are often created for other reasons than providing humans with food or a place for recreation; they can for instance be a way to lower energy costs for the building, reduce the risk of flooding during heavy rains, and provide wildlife with a suitable habitat. This type of green roofs, which can be combined with green walls, has also become a popular method for “hiding” a building, e.g. when a modern commercial building is to be erected in a forested or agricultural setting and must be prevented from becoming an eye-sore. Extensive vegetated roofs are often designed to be low-maintenance. Plants that are well adapted to local conditions are favored, since they will be more likely to survive without much care. 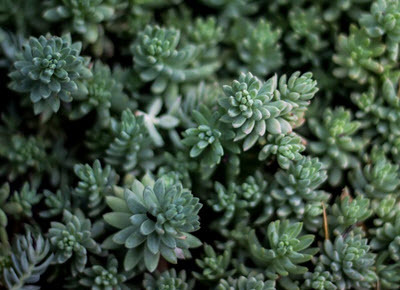 Succulents are for instance good at surviving without irrigation. Extensive vegetated roofs will usually not have more than a foot of soil, and shallow-rooted plants is the preferred choice. There are many examples of green roofs that have less than 4 inches of soil.